This tour is for those who are intersted to see the mesmerizing Lake Toba and Samosir Island with its indegenous culture and also seeing and witnessing Mount Sinabung which has been active for 2 years. At night there is a great chance you can see lava eruption. 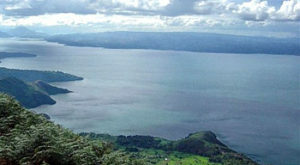 After breakfast then take boat to Samosir Island and visit: Tomok Village and see its Batakese King tomb, King Sidabuntar. Visit Ambarita Village known for its megalith site, court rock and King Siallagan tomb. Return to Parapat and then drive to Berastagi. Stop by at Sipiso piso waterfall and upon arrival in Berastagi you can visit fruit, vegetable and flower market. Check in hotel. You will be taken to villages where you can do observation of Mount Sinabung from safe zone about 7 km distance from the volcano. You will have chance to see pyroclastic flows. At night there is a great chance you can see the lava eruptions. Morning after breakfast drive about 3 hours to Medan. Drop you to airport. See You!